About a dwarf who is venerated as the son of God by his deeply religious followers in the Philippines. The film director Michael Noer handed his young neighbors Martin and Julie a video-camera; - Go out and shoot the dramatic moments in your life guys. A whistleblower attempts to reveal the secret behind a nuclear disaster that occurred during the height of the Cold War. Saw this at the Rotterdam film festival 2015 (IFFR). Actually, there are two plots, an unexpected surprise given the running time of only 91 minutes. In the first half of the film we observe how Lilly lives in the nursing home as partner of husband Max, who is the real reason they moved in there. It is clear that Lilly is too healthy for a nursing home, but she had no choice. Thus no surprise that we see a growing love between Lilly and neighbor Erik. As could be expected, this is a relationship being frowned upon by others living in the same nursing house, as well as by her daughter. That other residents gave her dark looks can be easily explained, given that women are a majority there hence a bit of jealousy is evident. Her daughter may have good reasons of her own, fearing that Lilly will decide to separate from Max with whom she lost contact some time ago, due to his illness hardly responding to outside events. Initially, resisting both type of "frowners" seemed to be the main story line. It is a relevant theme with its own merits, and could have been sufficient the fill up the whole running time. However, somewhere halfway we see an 180 degree turn in the story line. Lilly suffers memory problems, something that her daughter already knew for some time. 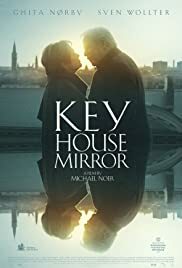 The title "Key House Mirror" refers to a memory test we see failing Lilly on. Of course, she herself does not believe it. Though Max is still alive and present, he becomes less prominent in the story. Lilly gets more and more focus, and also Erik but to a lesser extent. It took some time before Lilly gets convinced that she really has problems with her memory. A hefty scene at the family's former summer house is a turning point for her. What struck me most in this movie were the scenes in the nursing home. We observe the cosiness in organized form that is upheld for the people living there. It is a daunting preview on our own destiny, in the inevitable years that we cannot take care of our own pastime ways to fill our day anymore, and we may need physical help for each and every move. In the final Q&A we learned that most people we saw in the nursing home were playing themselves. At least 1/3 of the venue (all 372 seats booked) stayed for the Q&A, which is an unusually high fraction. A consensus opinion of those present during the Q&A, apparently people who had personal experience with elderly people, was their spontaneous confirmation that the way these people moved, and the look in their eyes, was true to reality. I consider this an achievement in itself. From the same film maker I saw Northwest (2013). I wrote very positively about it at the time. This new film proves that he can again arrive at a compelling product, albeit within a very different environment and a very different plot. This time we see normal community members rather than the underbelly of our society. Both times he made extensive use of non-professional actors around the main protagonists. From the Q&A after Northwest I remember this being his standard operating procedure, more of less coming from a past as a documentary maker.